Imaging Systems Technology is proud to introduce our new line of VectorVGA Pro stroke to raster scan convertor products. The VectorVGA Pro converts any stroke video signal from a legacy vector video source to standard raster video format that is viewable on any modern display. 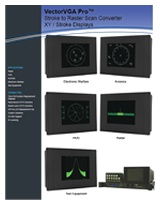 The VectorVGA Pro Scan Convertor enables you to view stroke video outputs from radar and sonar devices, spectrum analyzers, electronic warfare (EW) units, Heads Up Display (HUD) generators, and many other legacy vector sources using low-cost off-the-shelf displays. Rasterized stroke video output can be recorded using standard video recording devices. VectorVGA Pro Scan Convertors have all the features you need to rasterize your vector video stream, including adjustable input range and polarity, monochrome & color mode, integration time, and output resolution. Our custom configuration means you only pay for what you need; you don’t pay a premium for input and output options you’ll never use. IST will provide the level of engineering support you require to ensure your system integration is a success. No more spending hours reading long manuals and setting dozens of configuration options that don’t apply to your system. Simply tell our engineers what you need and we will make sure your system is configured properly. The VectorVGA Pro Scan Convertor offers a wide range of custom options such as differential inputs, connector type, custom video input and output: format and resolution, configurable gamma for RGB/Z input and video output, form factor, and much more. With the VectorVGA Pro convertor you only pay for the features you need. The VectorVGA Pro utilizes a powerful FPGA to render 65 million samples per second, resulting in faithfully rendered vectors that are true to the original analog signals. Not sure about your exact specifications, what resolution you require, or how our scan convertor can be installed into your legacy system? IST Engineers can walk you through your system requirements and provide on site installation and application support.